The biggest beauty of the Instant Pot is how you can create stellar one-pot dishes, and cook them pretty quickly. When my family began begging me for Asiago Chicken, I thought I don’t want to go through the massive work it takes to create this entire dish, dirty tons of pans leaving me with a big cleanup. But then it clicked, give it a try in the Instant Pot! At first, I was a little worried if it would work, but to my amazement, it turned out so creamy and cheesy, the whole family gobbled it right up. 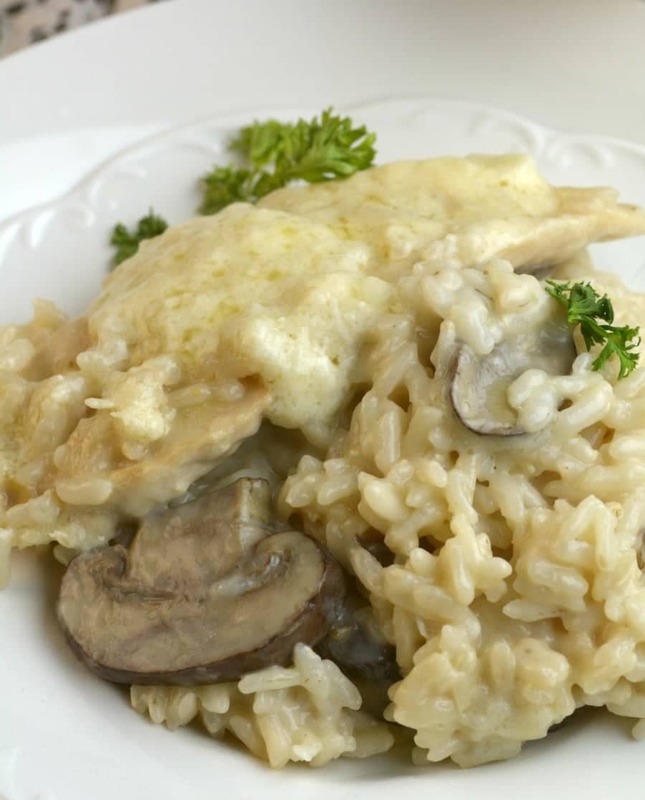 This one pot Instant Pot asiago chicken with mushroom risotto is a family favorite, especially when it is made in the instant pot! Prep and cooking was a breeze, as well as the cleanup! 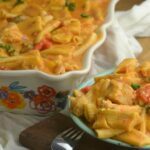 Before the Instant Pot came around, I will admit sometimes chicken dishes were a hit and miss for me. I struggled with finding the right cook time for the chicken. Sometimes the chicken got done earlier and I should have pulled it out because it got to dry. I never fully mastered the perfect cook time for chicken. But with the instant pot, you select the cook time and it does the work. The pressure builds up and cooks the chicken perfectly and locks in that moisture and flavor. So you never end up with a dry chicken, like I would have. One pot dishes are always a huge favorite of mine. I love not having a whole mess in my kitchen to clean up. Plus this one when you combine all the ingredients together it really blends the flavors. 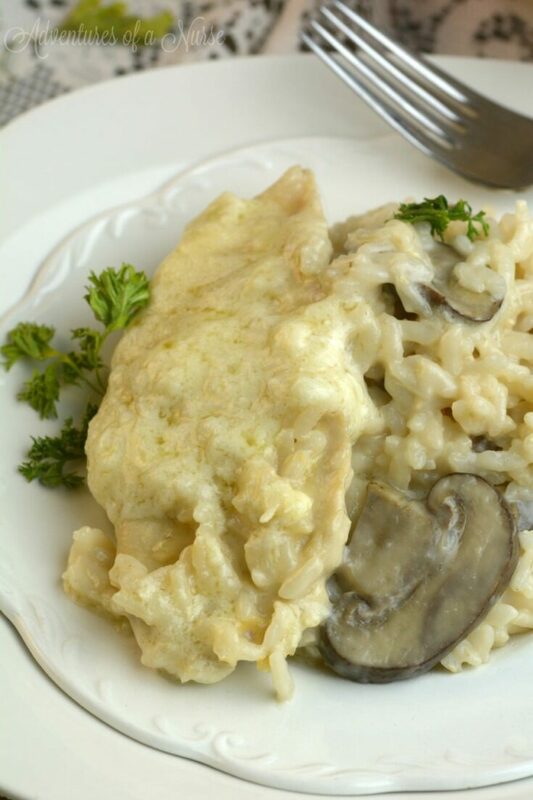 This asiago chicken with mushroom risotto truly can’t be beaten. It leaves you with a melt-in-your-mouth quality of rich flavors and a hint of garlic. We served this up with some rolls and every one of us used our rolls to soak up all the goodness on the plate. It truly had such a stunning blend of flavors, we have to keep making this dish on the regular. 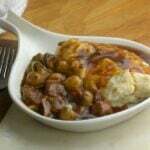 More One-Pot Instant Pot Dishes you may love is Instant Pot Meatloaf and Mashed Potatoes, Instant Pot Beef Tips with mashed potatoes and gravy Also, Instant Pot Chicken Riggies. On a Budget? One Month of Instant Pot Budget-Friendly Meals! 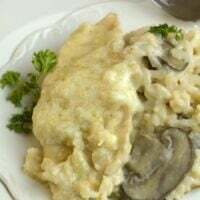 This one pot Instant Pot asiago chicken with mushroom risotto is a family favorite, especially when it is made in the instant pot! Prep and cooking was a breeze, as well as the cleanup! coat raw chicken with flour and set aside. Place the Instant pot on saute Add butter, and garlic cook till garlic is translucent but don't burn butter about 1 minute. Add mushroom, wine, and broth. Add rice and place chicken on top. Close the lid and place on manual high pressure for 10 minutes. do a quick release. Stir in milk and Asiago cheese. Stir and Serve. I hope you enjoy this as much as we did. This was delicious! I added some steamed peas too. Thanks for the great recipe! This was my second instant pot meal. It was delicious! I think next time I would add some seasoning. Very yummy! I too added more seasonings (pepper and an Italian seasoning), but it’s a very tasty base recipe. My fiancée said he’d eat it again, which is the mark of a good meal in our house! Only one question, How many will it serve? Yes, please! I will be so helpful to have portions with the recipes. New to insta pot cooking, if you double the recipe do you have to add extra time…..is doubling it even possible? I am new to Instapot cooking as well. If you HALF the recipe, is the cooktime the same? Made this last night, and it was delish! I would probably add more seasoning next time as well. Interested in the answer on halfing this recipe. Thanks! This was my first meal on the pressure cooker and still remains one of our favorites!! Yum! How does coating the chicken help with this recipe? There is a nearby restaurant that serves something very similar and it’s delicious but it’s also $17.95 a plate! I am so going to try this so I can eat it all the time and save some money at the same time! YUM! I’ve made this twice now. The first time it was pretty good… enough that I wanted to have it again, but the wine flavor was overpowering. Since playing around with my instant pot, I’ve discovered that a couple tablespoons of wine is usually enough to give the flavor. Because pressure cookers trap everything, there’s no evaporation of the wine like there would be if cooking on the stove. By reducing the amount of wine, I think this meal became a perfect dinner to serve to guests. I might try cooking the chicken separately next time, to prevent it from getting mushy. Awesome recipe! Eating it now and I love it! Was worried about the chicken but it came out GREAT! TY! Oh yeah, and I had to add onions just cuz risotto needs onions. This sounds delicious I’m not a big fan of asiago cheese. 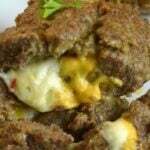 Is there a white mild cheese that could substituted? Can I sub boneless skinless thighs instead? I like dark meat better. Would it change the cooking time a lot? This was absolutely amazing!!! Thank you so so much for my new favorite recipe! I tried this mushroom risotto recipe exactly how recipe was stated and IP never came to pressure-BURN was on the display-It seems that there was not nearly enough liquid for the the 2 cups of rice—Any suggestions? did you use the rice button or low pressure? I kept getting a burn error with my instant pot. I even tried to double up the liquid but it kept burning before it could come up to pressure. I wonder….if I cut the recipe in half would I still use the same cook times? I’d like to try this tonight but there are just two of us. How would I cook the risotto without cooking the chicken? I assume the time would be different. Is there a #1 for instructions? I thought the same thing. Seems like something is missing from the instructors. Bread chick and set aside is step 2..
What is first step? Could we brown chicken before adding risotto? Hi there! I am loving your recipes so far! A question about this one – when you say 2 cups of the risotto, is it two actual cups – 16 oz, or two of the rice scoops? Thank you!